Kinder/1st Grade Performance is this Thursday at 6:00pm! Elect your favorite PTA board member and then stay to be serenaded by Thunderbirds. Childcare provided and Door Prizes to be won! The Thunderbird Fundraising Team needs you! I know you all enjoy all the innovative programs we have at THES. Blended Learning, Dual Language, Project-Based Learning and Social Emotional Learning are huge parts of what makes our school great. Unfortunately these amazing programs are not completely funded through the district and state. In order to keep them in our program we need to fill in the gaps. We are exploring different avenues to close these funding gaps and need to create a team with a wide variety of skills to help plan new ways to find sources of funding. If you are interested or have ideas please check out the Fundraising Team pdf for more information. It’s almost time for Cinco de Mayo! The 6th annual year end celebration at Guero’s Taco Bar is always a fun night with friends, family, tacos, music and drinks in the oak garden at Guero’s Taco Bar. Join us from 5:30- 8pm on May 3rd. Performances by The THES school Choir, THES Ballet Folklórico and Scott George and the Other Guy. Do you enjoy styling in your Thunderbird gear? Wish you had more? You can make it happen! The Spirit Store Coordinator is in charge of ordering merchandise and T-shirts, tracking inventory and organizing volunteers for Spirit Store sales. This position helps ensure that parents are kept informed about what’s happening at the school. The Communications Chair leads a team to update the website, maintain our social media presence, and send the e-folder/Wednesday Folder each week. Today click on the link below and you can learn about asthma. 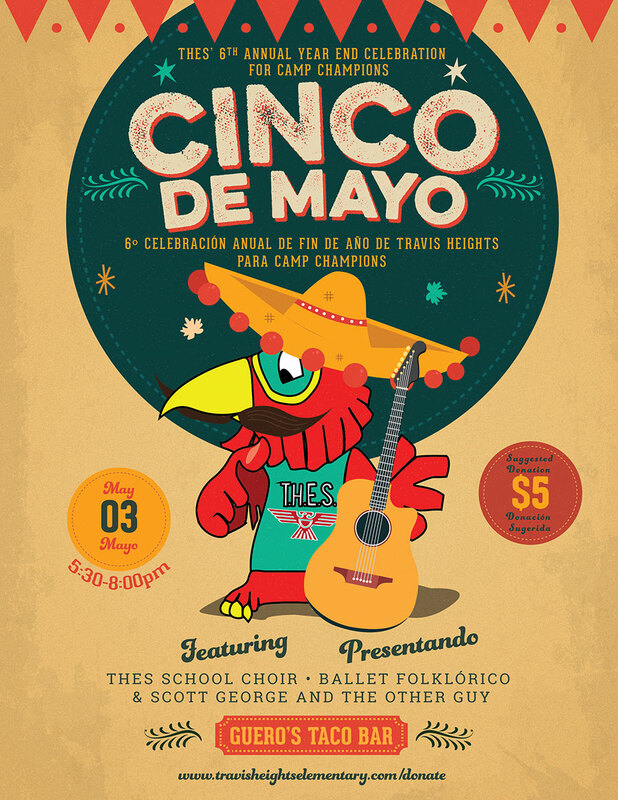 Join us as we celebrate the end of the school year and raise money to send our 5th Graders to Camp Champions!